The labor force participation rate has dropped in recent years. One theory to explain that is that "everybody just gave up trying to find a job" and became what the government labels a 'discouraged worker'. So they are NOT in the labor force and they gave up hunting for work after being unemployed. I looked up the discouraged workers in the BLS Table A-16 and I got general labor force size and civilian noninstitutional population size from the query tool. 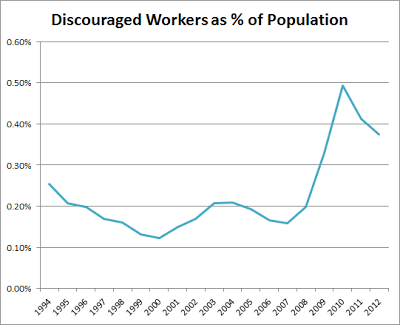 FIrst we can clearly see that the % of the population that was in the 'discouraged' category clearly peaked after the recession. It more than doubled. However the net increase was till only about 0.3% of the population and thats not any kind of giant shift in the labor situation. Even if you took all those discouraged people and added them to the unemployment ranks then it would have only added 0.5% to the unemployment figures. Second I'll point out that the number of discouraged workers bottomed out around 0.15% even during relatively low unemployment periods. Theres always some discouraged workers. I suspect that is due to evolving labor market and some occupations becoming obsolete or irrelevant. Certain industries or fields may see higher rates of discouraged workers even while the rest of the population enjoys a good employment picture. Now lets compare the % of the population that is currently discouraged versus the percent that is part of the labor force. I put those two axis in the same scale so you can see how the numbers compare. 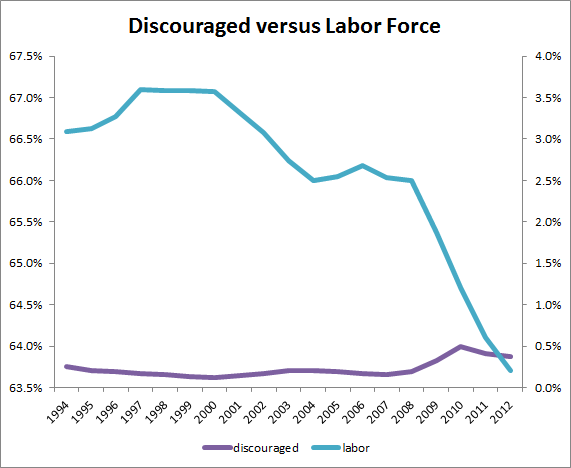 As you can see the amount of discouraged workers does not vary as much as the percent of the population thats in the labor force. From 2009 to 2012 we saw a drop of about 2% in the labor force participation rate. 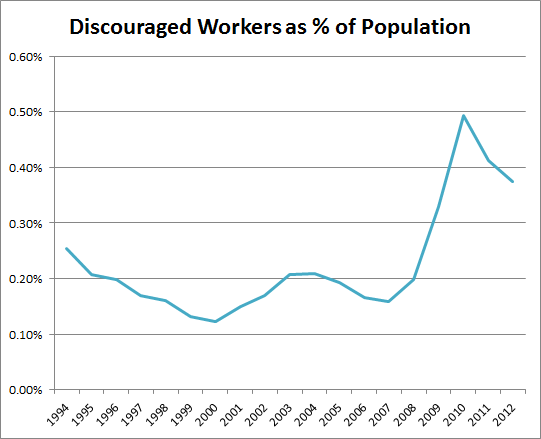 During that same time the % of the population that was discouraged rose around 0.2%. 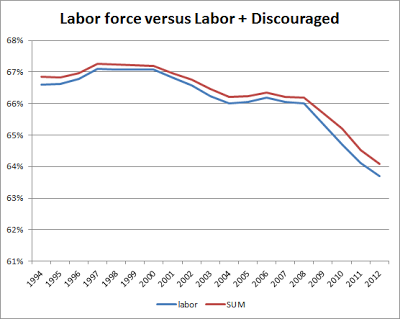 Finally I'll show the labor force versus the sum of the labor force and the discouraged workers. 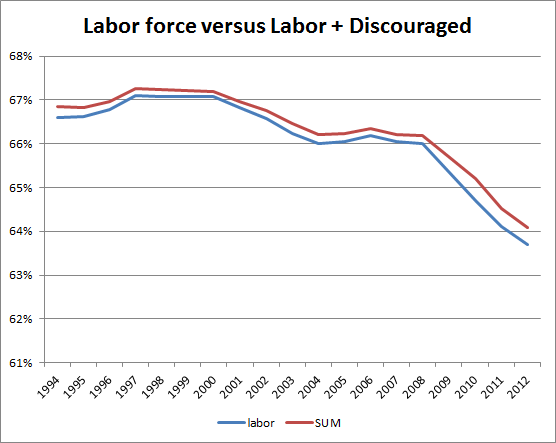 So that red line is how the labor force would be if we had no discouraged workers.